To improve our aquatic/riparian restoration program, IRM utilizes a tracked ATV that allows our restoration technicians to access remote wetlands that would not be possible with standard ATVs. 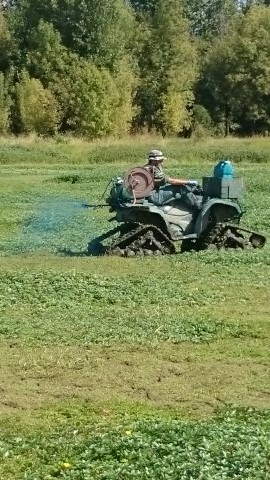 The tracked system allows the ATV to “float” on top of vegetation or mud, reducing environmental footprint of the vehicle. In addition to our tracked ATV, IRM has a fleet of 5 standard 4×4 ATVs for restoration services. Both our tracked ATV and our standard comes equipped with a boomless nozzle for broadcast herbicide applications, a hose & gun for herbicide spot spraying and equipment transfer boxes for transporting herbicide jugs, planting materials or other restoration gear. This setup can carry up to 35 gallons of herbicide solution per trip.